People in the modern world are living with help of technology and electricity. Everything has been industrialized and modernized that people today prefer something new, something luxurious and something innovative. To most of people in big cities especially the young generation, market is no longer a term sounding familiar and a necessary place for them to go shopping. However, to people of the ethnic minorities in particular, market is still a traditional and cultural feature and they find it very important for their lives. That is why Can Cau Market exits till today and it has been an interesting point and site of people in Sapa that attracts a large amount of tourists every year. Can Cau Market is situated in Can Cau commune, Simacai district, Lao Cai province. It is far about 100km from the market to Lao Cai city to the northeast, and nearly 30km to Bac Ha market. From afar, the scenery of the market is actually beautiful and lively. 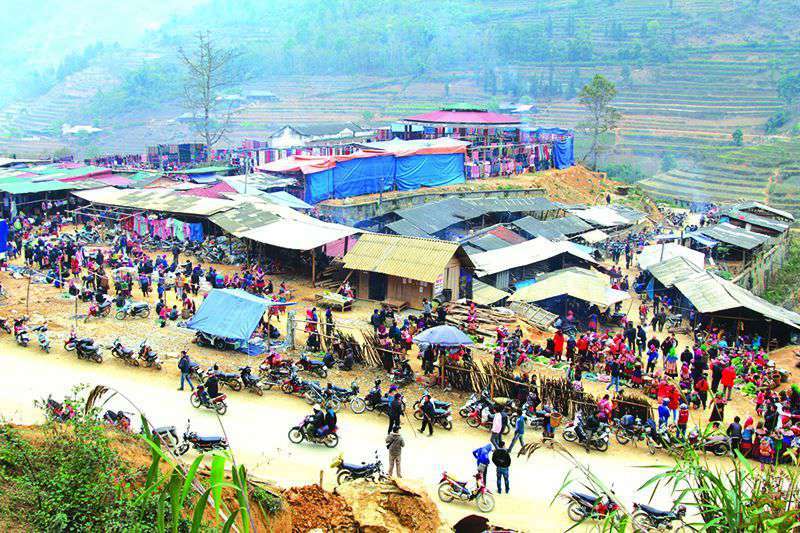 The market is organized right on roadside of 153 Road – the only red soil road connecting Bac Ha town to Simacai borderland town. Can Cau Markets is surrounded by the untouched lush Northwest forests and endlessly stretching rice terraces clinging to the mountainside. Here, tourists will find easy to catch a colorful upland fair in the costume of young girls of Hoa (Chinese) Hmong, Tay or Ha Nhi ethnic groups. Exploring Can Cau Market is one of things to do while in Sapa. Going to Can Cau Market, tourists have a chance to much more soak up the vivid upland fair; simultaneously, ascertain about the daily life of the locals. If Bac Ha Market is only held on Sundays, Coc Ly on Tuesdays, Can Cau market is a busy market which is held only on every Saturday starting at early around 7:30 AM. Located just below the Chinese border, all kinds of goods are traded here, from fabrics to various types of livestock to the powerful local corn wine. 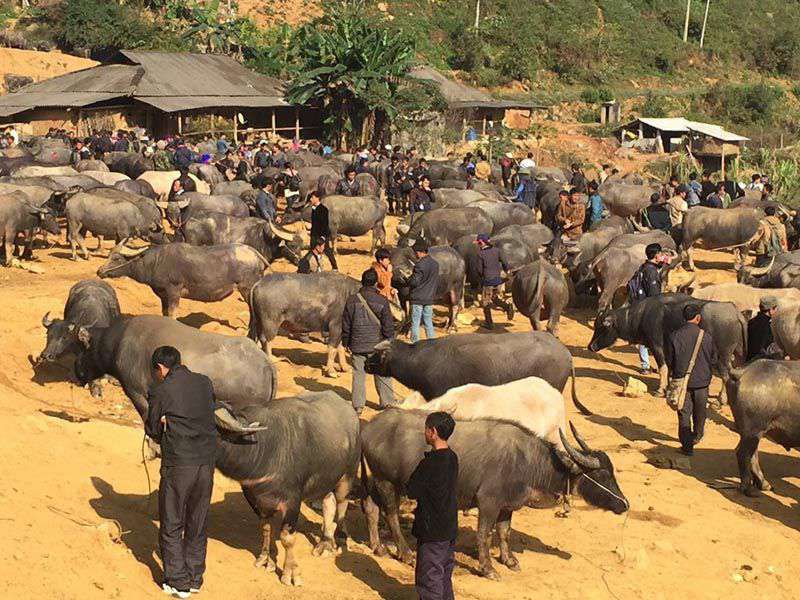 As one of the new attractions in Sapa, Can Cau Market is considered as the fair of Hoa (Chinese), Hmong and Giay ethnic people, yet it is organized in business practices of Dao people. The market is divided into numerous separate pavilions for all sorts of items. These products here include kinds of vegetables, herbs, spices, utensils and colorful brocade. 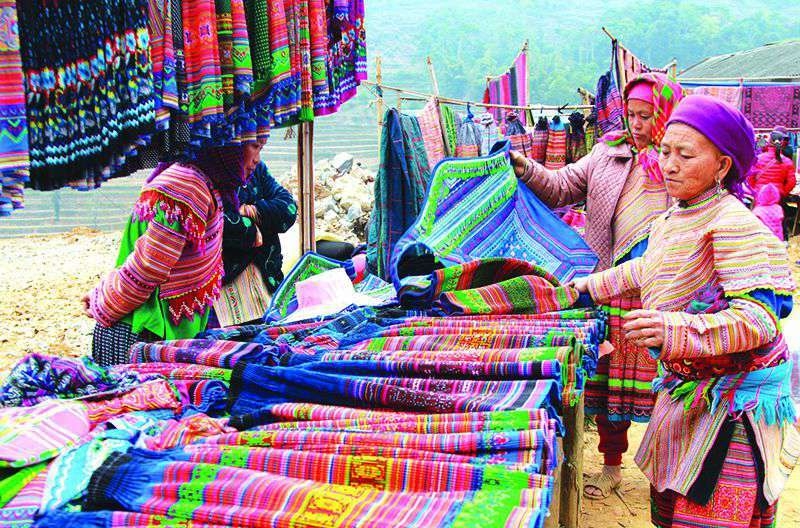 Here, tourists have the opportunity to choose for themselves the most beautiful brocade products from ingenious talent of Hoa, Hmong women. Most of the products are shown on the plastic sheet on the ground in order that both buyers and tourists can be easy to recognize. However, the most striking is the area selling cattle and poultry. The locals extremely love animals and always would like to choose good cattle breeds for their demands. The atmosphere in this area is always bustling. Buyers and sellers scatter along the road to deal each other. Besides, the area for the traditional dishes of ethnic people is extremely exciting. Mingling with the mist surrounding shanty shacks is the multitude of different sounds: voices of purchasing and crackling sounds of bowls colliding each other. In the bustling atmosphere, tourist will actually be hard to resist savoring the ethnic cuisines. Of all the dishes here, “thang co” – a traditional dish made from soups and mainly horse meat – may be the most favorite dish of the ethnic groups and tourists. It is one of the unique traditional dishes of upland minority which is indispensable in each fair. In particular, corn wine is also one of the drinks tourists should not ignore when arriving here. Flavor of this kind of wine will be much different from elsewhere. There is nothing better than sitting around the “thang co” pan to enjoy delicious specialties in the lively atmosphere. Coming to visit Can Cau Market, tourists not only enjoy the wonderful scenery as well as colorful fair but they also have a chance to experience lives of the ethnic minorities so uniquely and distinctively that they could hardly find anywhere such amazingly cultural features like this. Escaping from the hustling and bustling atmosphere of noisy urban life, tourists go there to look for the pure and pristine beauty, to immerse in the idyllic activities of local people. Having to say, Can Cau Market has contributed itself to the valuable feature for the image of Sapa in general and for the ethnic minorities in particular.